UBC Historical Photograph: UBC 1.1/1080. “Showing army huts [sometimes referred to by early faculty/students as ‘Hotentot Huts’] south of the Library”. 1948. If this view of the UBC Main Library (today known as the Irving K. Barber Learning Centre) seems strange, it shouldn’t be surprising. It has been awhile since the library building and environs have appeared this way. The main entrance of the library isn’t visible. The windows on the right side of the photo are where the stacks were located and the windows were on the opposite side of the building from where the main entry was. If that still isn’t clear, try this: Imagine you are standing near where the clock tower is today; you are facing the library’s main entrance. The wing of the library on your right is where the temporary army huts are located in this image. During time spent at UBC in the late 1980s, I recall a faculty member referring new students to “the bus stop coffee shop” not far from the Main Library (roughly where the campus White Spot is located today, inside the David Lam Management Research Centre) as being the source for the best cinnamon buns at the university. And I recall wondering why the coffee shop was so named. There were certainly no buses anywhere near that location. (In the 1980s and until relatively recently, the central bus loop was located adjacent to where the Student Union Building is). I believe the UBC Campus buildings shown here were, moving l-r: Agriculture (now math annex), Bus Stop, Gymnasium (now Buchanan Toewer), Main Library, Science building. cdm.arphotos. 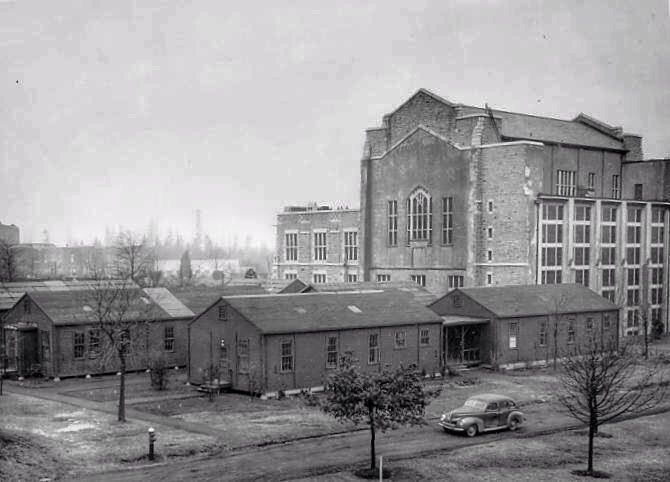 UBC Historical Photograph: UBC 1.1/308. 1930. Leonard Frank photo. It wasn’t until stumbling across the image above that this low-grade mystery was solved for me. The structure in the middle of the Leonard Frank photo is the central bus stop in 1930. And, yes, the bus stop appears roughly to be at the same location as the Bus Stop Cafe of the 1950s-1990. This entry was posted in books/reading, libraries, schools/colleges/universities, street scenes, war and tagged bc, history, huts, irving k barber learning centre, main library, UBC, vancouver. Bookmark the permalink. Small correction: left-to-right the buildings are Agriculture (now the Math Annex), Bus Stop, Gymnasium (little pyramid shape beside bus stop, now the site of Buchanan Tower), Library, Science. Otherwise, nice article! Thanks very much for this, Erwin. 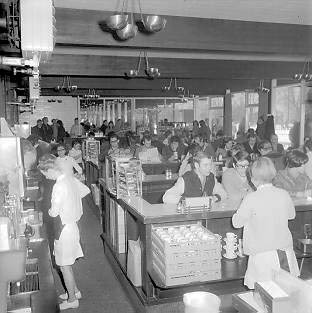 Very interesting – when I was at UBC ’66-67, the place for cinnamon buns was Brock House – period. I have no memory of the Bus Stop Cafe. Meant Brock Hall, not Brock House.